The trio is in two movements and is approximately 6'15" minutes in duration. The idea of composing a work for double reeds was born out of my participation at the Forum des nouveaux répertoires pédagogiques at the Conservatoire du centre Mozart, Paris in December 2017 at the invitation of Marika Lombardi who had organised a performance of my Oboe Sonata on that occasion. 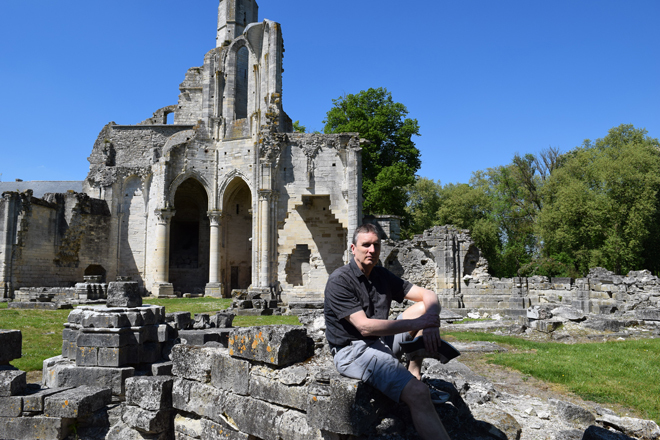 Some months after, in early May 2018, a visit to the Abbaye de Chaalis coincided with the composition's completion, and this excursion ended up giving me the title of the work. I wanted to produce a work using traditional melodic materials that could be approached by less-advanced players while at the same time would eventually be interesting harmonically to players of any level. Discussion at a round table at December's forum brought up questions around contemporary musical aesthetics, and the usefulness of the label "contemporary" to define music composed today, considering the often polemical nature of what is wanted as valid cultural transmission. Sitting in the Ruins was therefore a rather oblique reference to the idea of the endurance of the fundamental building-blocks of music itself, such as pure melodic construction, irrespective of its system of tonality. In this context the ruins are a symbol of what an extremist position might provoke through an over-zealous pursuit of what some perceive to be new, or regard as axiomatic today. Saturday 16 February 2019, 3.30pm. Performance of Sitting in the Ruins at the Conservatoire Municipal W.A. Mozart, 7 passage de la Canopée, Paris 1er. Gena Liévano and Louis Luciat (oboes) and Shoan Eon (bassoon). The Trio was performed at the Forum des nouveaux répertoires pédagogiques, Saturday 1st December 2018 at the Conservatoire Municipal W.A. Mozart, Paris 1er, by the students of Marika Lombardi.